Worn-out and damaged tyres can put you in danger of a blowout that could seriously damage your car and risk your safety. Your tyres can wear different rates because each tyre on a vehicle carries a different amount of weight. Changing your tyres periodically is a good way to get an even wear on tyres instead of buying a full set unnecessarily when your tyres wear out unevenly. Additionally, tyre rotation also helps to remove uneven wear on all four corners, obtain balance handling, improve performance, and prolong your tyre life. In this article, there is a handful of useful tips and tricks for how to rotate your tyres and when the best time is to do it. When Is the Best Time To Rotate Car Tyres? Are you having trouble with uneven tread wear after around ten thousand kilometres of driving? In general, tyres nowadays last an average of only around 40,000km, but it is still significantly longer than 8,000 km which was an average tyre’s lifespan in the 1970s. Tyre life is influenced by several reasons. Improper driving habits, drastic change in temperature, air pressure at an inconsistent level can all shorten the life of your tyres. As a rule of thumb, drivers should rotate their tyres every 10,000km. Although it is not easy to know exactly how long your tyres have lasted, you are likely to have a feeling of when your tyres need to be rotated by a simple eye test on the tread. You can check with a qualified mechanic or experts at a tyre centre. An easy way to remember is that you can time tyre rotations whenever you get an oil change. 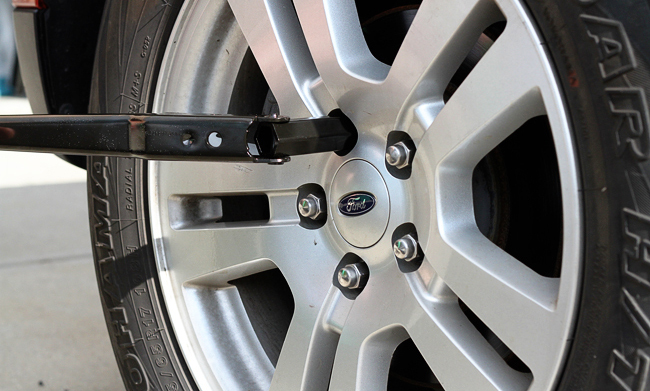 Although manufacturers don’t recommend the jack as a tyre rotation tool, a jack can be used in conjunction with other tools to lift up your vehicle one tyre at a time. Alternatively, buying a hydraulic floor jack for about $100 is considered a safer route. A good car jack will do though. 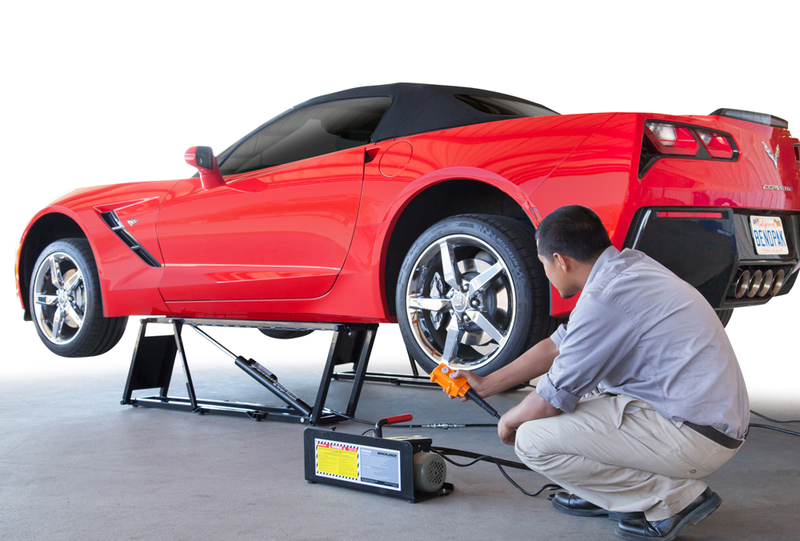 The Jack stand is also an important tool that helps you switch the tyres out. A decent set of jack stands is usually about $30. You can jerry-rig a jack stand with a large block but this is not recommended. 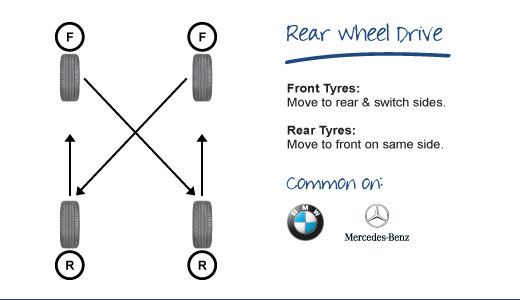 2.Rotation Pattern: Directional or Non-directional tyres? When you rotate your tyres, one of the most important factors you should consider is directional or non-directional tyres. 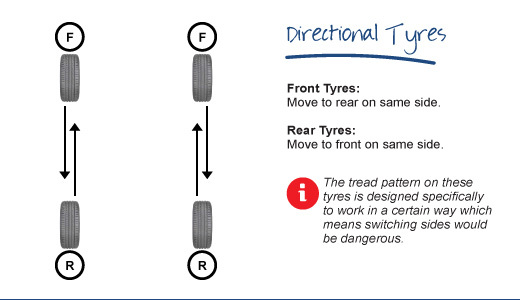 A “one-way” tread pattern on directional tyres are designed for the direction the tyres rotate on the car, particularly made for either the left or right side. The grooves do a good job of channeling water out from under the tyre on wet surfaces, reducing hydroplaning and improving wet traction. Arrows or triangles on the sidewall describe which way the tyre will turn. To rotate directional tyres, just switch the front right tyre for the back right tyre, and the front left tyre for the back left tyre. Non-directional tyres have a tread pattern optimized to be mounted on any wheel. Use the cross pattern if you want to rotate non-directional tyres. The front tyres move to the opposite side of the front-rear tyres: left-front to right-rear and right-front to left-rear. If your vehicle has differently-sized directional tyres on the front and rear, the tyres will need to be dismounted from the wheels, and remounted and balanced on the opposite wheels. The rear tyres are moved straight forward. Do the opposite on vehicles with front-wheel drive. Move the rear tyres to the opposite sides of the front and move the front tyres straight back. move to the opposite sides of the front axle. You can place chocks in front of the front tyres and behind the rear wheels, which must be on the opposite side where you are. Remember to loosen the lug nuts before jacking up the vehicle. You also should place the car on the flat ground that is easier to get them off because of their resistance. Besides, drivers shouldn’t leave the tyres in the air as you can strain the transmission while wheels are free to spin. Most of today's vehicle tyres have five-plug patterns. Make sure you will loosen them in a star pattern, which helps to remove warpage of rims, particularly important for fragile rims like aluminum or magnesium wheels. In case your car has a four-plug pattern, you can easily loosen the nut diagonally across from the one you've just done. Lug nuts are more difficult to untighten than others. You can put your feet on the handle of the wrench, then kick it once to crack the lug before loosening the rest of the way. One plus trick is to use a breaker bar that smooths out the process. When the lugs unscrewed from tyres but still on their threads, put the jack under the car. You can look out the manual from manufacturers for more information of the right position of jack. 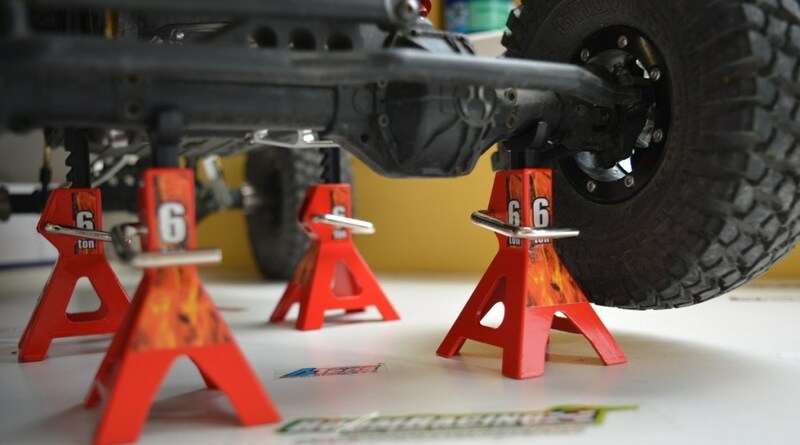 Plus, placing jack stands under the car is the safer solution. You can also mount the spare tyre on any hub that’s missing a tyre as a placeholder. If your car has a full-size spare, you may rotate it anyway. A tip here is that you should place the car on the solid surface for lowering and raising your car quickly. When you want to remove tyres, loosen the lug nuts with your finger, then rotate wheels according to your type of tyre pattern. Conversely, if you put tyres back onto the mounts, lower the car from the jack stands, take the lug wrench and tighten all lug nuts. Move on to the next tyres and repeat the process. Note that you can tighten the lugs with sufficient resistance but avoid damaging the rims.